...All these are played vigorously and with beautiful tone, the demanding parts for both instruments tossed off with the greatest of ease. Excellent audio, as well. Recommended! ...But, as I say, while Reinhold is a consummate violinist, he never seems to want to draw too much attention to himself but rather to the music. This means that while you may find greater pyrotechnics from other violinists, you'll find none who demonstrate the value of the music better than Reinhold. 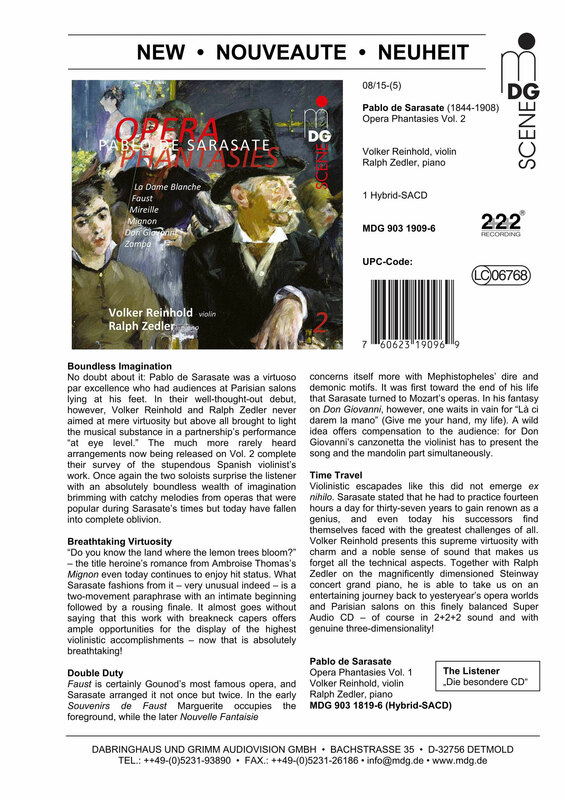 Violinist Volker Reinhold and his accompanist Ralph Zedler continue to explore the opera paraphrases by Pablo de Sarasate, and like in the first CD of this series, they give a delightful and eloquent account of the music. ...Of all the works on the disc, I think I enjoyed the Magic Flute Fantasy best of all. There's a delicacy as well as a zest about Mozart's music that Reinhold and Zedler capture brilliantly. Here, it also becomes clear that the two performers have been collaborating for years, their parts working beautifully, seamlessly, effortlessly together. ...Most of these are relatively unknown, but all are showcases for the soloist, replete with the technical demands one would expect from one of the great masters of the instrument, Volker Reinhold (b. 1963) meets these requirements with beauty of tone and virtuosity, ably accompanied by his long-time accompanist, pianist Ralph Zedler. Audi is rich and well-balanced. A fine release! ...And Herr Reinhold proves you do not need to have a big name and powerful PR backing to be a superb violinist and well worth listening to. Violinist Volker Reinhold specializes in particular virtuoso music, principally the pieces written by Pablo de Sarasate and Fritz Kreisler. 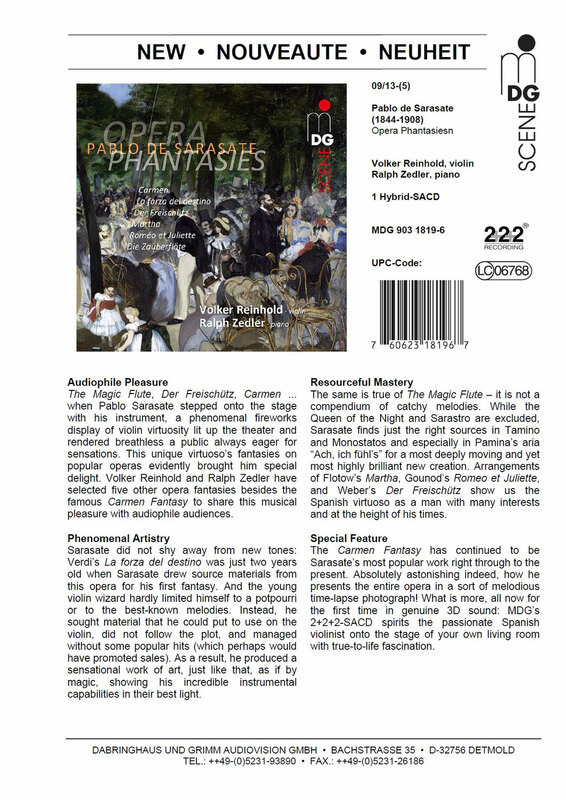 Together with his piano partner Ralph Zedler he has recorded six Sarasate paraphrases in a very individual and extremely imaginative manner, with a lot of sensitivity and knowledge around the opera contents. One does not often hear such a spirited and tasteful playing, paired with musical refinement. These arrangements based on various operas were composed by the late Spanish virtuoso violinist Pablo de Saraste. He didn’t always include melodies taken from arias, choruses, or overtures in the order in which they appear in the opera, as he wasn’t interested in the work’s dramaturgy, but in the melodic character of its “components” (my quotation marks). Not surprisingly, Saraste’s Fantasies demand virtuosic skills from the violinist performing them. 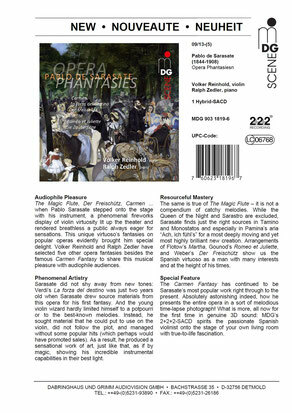 This is another recording that won’t necessarily appeal to opera lovers, but the material is performed by outstanding artists.